I know what you're saying -"Another JoS. A. Bank sale?" Yep. Each one is better than the last. 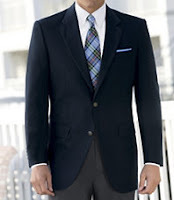 This time if you purchase one suit or sportscoat and they will toss two more and two dress shirts for FREE . Oh, what the heck... toss in FREE shipping too. I'm no math wizard, but I can't see how they are making money on this. I also know that might be one of the best deals I've ever seen. If you're there, why not check out their other deals too, like half-off all sportswear (plus 4th free) and 25% off already on-clearance items? Click here to view the deal at JoS. A. Bank.